For its third collaboration with La Biennale di Venezia for the 16th International Architecture Exhibition, the V&A will present Robin Hood Gardens: A Ruin In Reverse, centred around fragments of Robin Hood Gardens that will be transported to Venice from Poplar, East London. These concrete fragments come from the internationally recognised housing estate by Alison and Peter Smithson, which is in the process of being demolished. In 2017, when destruction was imminent, the V&A salvaged a three-storey section of each façade and the original interior fittings of two flats. Inside the pavilion, the V&A has commissioned a new work by Korean artist Do Ho Suh, whose practice centers on capturing memories and questioning the meaning of home. In Suh's film, which makes use of the latest technology in 3D-scanning and photogrammetry and will be projected on a 13m-wide screen, the camera moves along the walkways and appears to cut through the building, depicting and revealing domestic interiors within the modular plan. Do Ho Suh’s installation presents a panoramic record of the architecture and interiors before they are torn down. 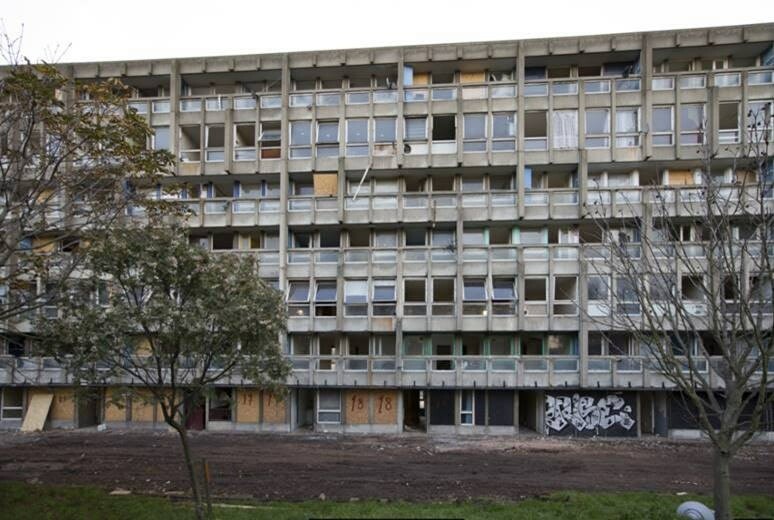 Read more about the V&A's acquisition of a three-storey section of Robin Hood Gardens. Visit La Biennale di Venezia website. Read a report in The Guardian.